Valentine's Day gifts need not be expensive. You can convey your feelings without spending much. Check out 10 unique Valentine’s Day gift ideas within $10. Yes. Valentine's Day is knocking at your door and you’ll have to buy a gift for your special someone along with your near and dear ones. Are you just struggling to manage your finances after holidays and Valentine’s Day is putting an added burden to your wallet? Don’t worry. You can gift your special someone along with your near and dear ones without spending much. Here are 10 unique Valentine’s Day gift ideas, which you can buy by just spending $10 or less. Roses always top the list when it’s all about Valentine’s Day gifts. However, instead of gifting a real red rose, why not gift a crystal rose this time. Doing so, you can show that your love for your partner will last forever. Undoubtedly this should be on the list when we’re talking about gifts and it’s Valentine’s Day gift. You can get chocolates of various types and prices and you can choose as per your and your loved one’s taste. Not only gifting your partners, chocolates are great to gift your parents, your children, your friends, and others whom you want to gift on this Valentine’s Day and make them feel special. It is a great way to gift a useful item and show your love at the same time. If you want to gift such an item, then ‘Love and Hugs’ salt and pepper shaker set is an ideal gift for you this Valentine’s Day. If you want to express your love every day, then you can choose this gift. In this waterproof notepad, you can write your to-do list along with little love notes to express your love on a weekday or when your partner is going through work-related tension. It will surely bring a smile to your loved one’s face. You can even keep one to pen down your shower thoughts. Often we come across ideas or remember items to purchase during the shower time. So, help your special someone to stop taxing their mind and write down thoughts even while taking a shower. This surely can brighten up your boyfriend/girlfriend’s life and will be a reminder of your love every day when they drive car. The key chain consists of a heart and a key beautifully embedded together. Though this is a common gift, yet it’s a precious possession for the couples. You can even find uncommon styles in his and her pendants. Buy one and flaunt them to celebrate eternal love that you’re committed to your partner. This is a good gift even if your Valentine stays far and you can’t meet him/her this year. You can just send the respective portion and both of you can celebrate this special day even across miles. What can be the better way to express your love than watching a lovey-dovey movie together? It won’t cost much if you gift one or two movie DVDs. You can get it within $10. 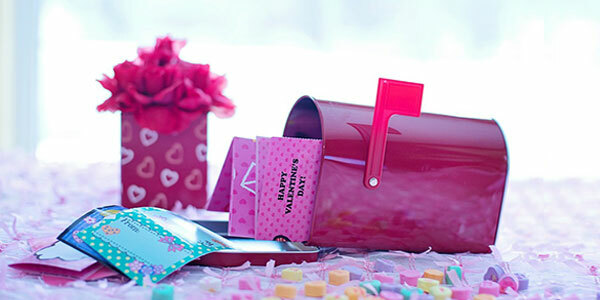 One of the best ways to express your love is to bake special Valentine’s Day cookies and write a personal message. You can make and gift a box of such cookies. Your near and dear ones will appreciate the effort of making gifts with your own hands. Personalized gifts are always special. You can just make a special card with the things you already have at your home and believe me, the person whom you’re gifting will highly appreciate it. We all want to cherish our good memories and that’s why we all love pictures, letters, cards, and cherish them. So, one of the best gift ideas for this Valentine’s Day can be a journal or a documentary book where you can paste pictures of your special moments and can relive those memories together. Both of you can continue adding your memories as you create them, and after 10 or 20 years, sit together and cherish your times spent together.